Days 1 & 2: England 553-5 dec. The image of cricket is one where turning out to watch a game isn’t about being resolutely partisan. Individual and team achievements by the opposition are lauded and applauded almost as warmly as those by your own. Well, that is true, and part of its appeal, but it’s easy to get tugged into a more negative appraisal of a days play if your side do not come out on top. Last year for Pakistan at Headingley, two days play were affordable, but sadly now I’ve left the provinces, and I’m into London test match pricing. Thanks to choosing two days, it meant we got to see one of the highest third wicket test partnerships of all time by Billy Beardface and Younis Khan. Which you enjoy, but it soon makes the beer boys of the Western Terrace restless when hours pass without England nabbing a wicket. Thankfully turning up on the Sunday meant that after a few more of those attritional hours, there was a flurry of wickets, and memorable ones; Inzi Big Potato falling over his stumps like a rotund pensioner rolling into a shallow ditch, and Monty Panesar taking the sort of athletic, diving catch thought beyond most, let alone our Mont. As it turned out it was the highest ever test partnership in a losing cause. Hindsight helps the magnanimity of our appreciation in this case, I guess. However having only one day to choose this year, it appears we may have been one day behind the pace. Yesterday, four England batsmen occupied the crease, and all left as centurions to standing ovations. 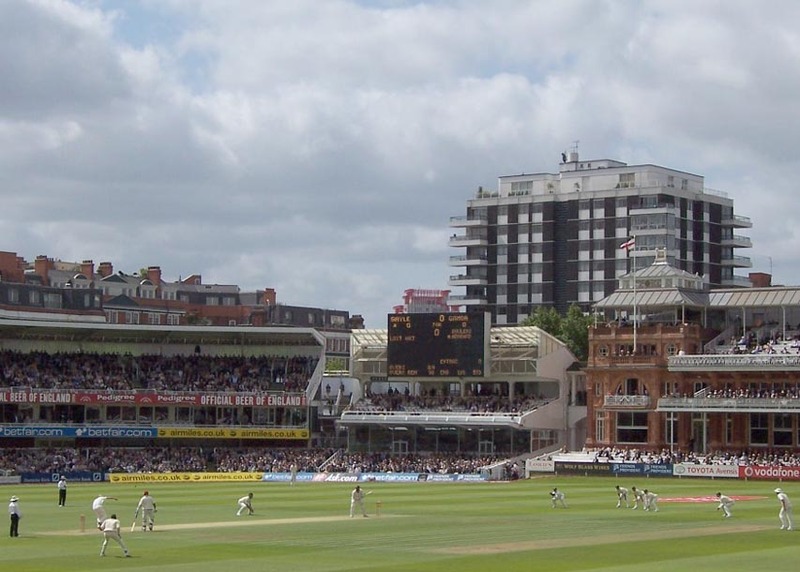 Today, much was expected from an England bowling attack refreshed and all performing well in county cricket, particularly those who had not gone to the World Cup. Also, the rain promised earlier in the week was apparently not now going to arrive, and everyone was here. Well not everyone, as there were a few empty seat, but Bella Emberg was here, and that is surely just as good. Yet, it was, by and large, the West Indies’ day, so much so that the incessant sledging coming from the pocket of West Indian fans near ourselves in the Compton Stand barely let up, and by 6:30, renditions of ‘One Love’ and ‘I Shot The Sheriff’ had been attempted. I stress attempted, as what they gained in repetitive chunter, they lost in tunefulness. It is frustrating as, in theory, the Windies were ripe for a thrashing. Their bowling performance over the first two days, outside of the pre-lunch sessions, betrayed their position as the worst established test side around, and expectation was high. Even as early as 11:21, the child sat next to us was asking “are they ever going to take a wicket?” Nothing less than a 4-0 whitewash will do it seems. However, like the Windies, the pace bowlers only seemed to have any effect before they tucked into their lunch. At the start of the day, Harmison looked firey and Hoggard was finding a little swing, if not as much as he would have liked. Then Plunkett came on and took the first wicket in his opening over, uprooting a pretty set-looking Chris Gayle’s off-stump. In the afternoon session though, there was rapid deterioration amongst the quicks, physically so in the case of Hoggard, who limped off with a thigh injury seemingly not to return in this test, if not the next. Harmison can have no such excuse, as his hostility ramped down to vague interest, and his radar took a hit as well, a number of balls sailing so wide as to suggest he was pitching the ball off the upturned hull of a small boat, to cause any real concern. It is a worry with Harmy, the world’s top bowler three years ago, that his performances now on the big stage are wittling away at his talent and his confidence, his post-Ashes demons not being put to rest. It appears to be a kind of modern art project, where he attempts to carve a 4ft curled-up-in-ball-under-some-coats-somewhere-in-Northumberland personal effigy out of his 6ft standing self. Thank goodness then for Monty, who continues to be treated as though somewhere twixt cult hero and special needs kid by the crowd, regardless of what he does. During left-hand/right-hand partnerships, as he moved constantly between fine leg positions in front of the Mound Stand and then in front of the Compton, he was, each time, greeted as though he’d taken a hat-trick in the previous over. It kind of reminded me of a certain American professional wrestler, going to the crowd at each side of the ring after a winning bout, flipping his forearms into a cupping of his ear to up (and eat up) their cheers. That’s right, Monty Panesar is only a Sanchez ‘tache and an animalistic ripping of his team-shirt away from being Hulk Hogan. I genuinely believe that you’ll have heard that here first. However, that is not to say that Monty was not due any praise at all. He was the only bowler that caused the West Indian batsmen to fret, and this on a green-top pitch that wasn’t turning, in a game he almost didn’t play in because of it. Instead of ripping the ball out of the dust, Monty merely used the suggestion of possible spin to come as his tool. As such, his very first ball goes straight on, beating Devon Smith’s expectation of turn, and knocking off the bails. Three more West Indians were foxed during the afternoon, perishing to front-foot leg-before calls with the ball not veering, thus convincing umpire Asad Rauf, correctly, that the trajectory was true and trapping. Paul Collingwood also performed well with the ball, accounting for Dwayne Bravo by tying him up with a cheeky bodyline bouncer that was flicked into the hands of Alistair Cook at deep mid-wicket. However Owais Shah looked a little lost and pedestrian in the field, which after a poor first innings showing, will make dropping Michael Vaughan back in that whole lot easier. Also new coach Peter Moores’ apparently nepotistic demands for Prior, and the jettisoning of the Badger (despite his oddly reassuring, if barkingly eccentric, presence during the World Cup), appear justified. 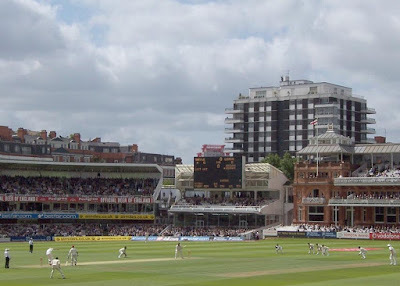 Lords is not known as an easy place to keep, but todays performance suggested he can do the tricky things well, grabbing a number of the more wayward leg-side deliveries before they crashed to the boundary, but shelling a number of regulation takes. However, after a rapid-fire debut ton, I think we’ll give him more than the benefit of the doubt. As the day dwindled to a close, there was a minor fillip, with Plunkett taking a second wicket and drawing to a close Denesh Ramdin’s very tidy, thrusting lower order knock. England then finished still on top, but with the West Indies now playing only for a draw, with both considerable patience and the strength of positivity I might add, and having overcome the psychologically boosting follow-on mark, England will need to find something from deep within to be able to take thirteen more of their wickets, however easy they might be finding runs to come by.